Historically, two major types of 'contraband' come over the unsecured southwest border: economic migrants and marijuana. Any initiative predicated on closing the border using a market mechanism -- including ours -- has to deal with both people and drugs. As luck would have it, cannabis legalization is crushing the marijuana smuggling business. Seizures of marijuana by Border Patrol over the unsecured border in 2019 will have dropped by 80% -- 80%! -- since the start of the Trump administration. This year, marijuana seizures will stand at only 5% of their 2009 high. That's incredible progress, and exactly the effect we're looking to achieve using an analogous legalize-and-tax system for economic migrants. But is it enough? 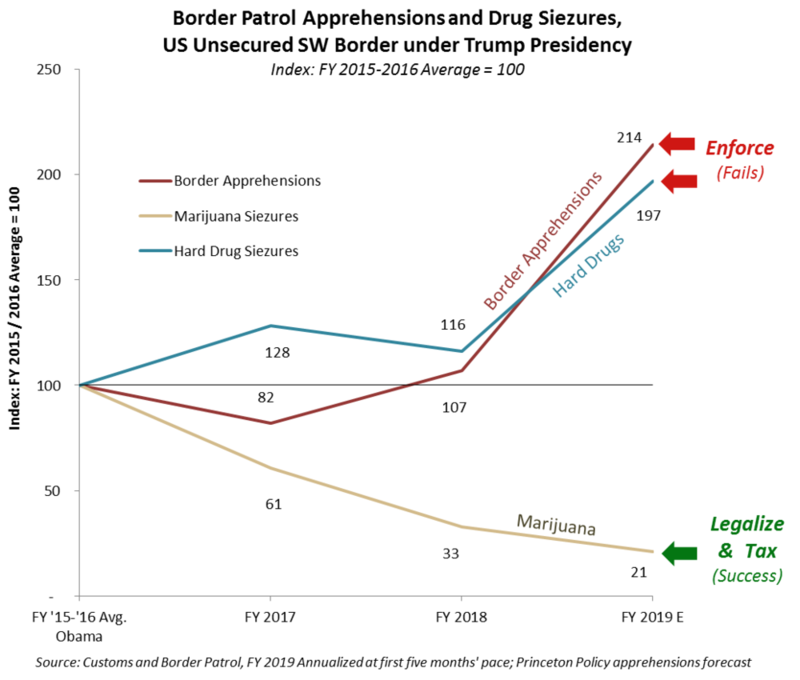 As the graph above shows, although marijuana seizures have plummeted, both border apprehensions and hard drug seizures will be nearly double the level of the last years of the Obama administration. Even if legalization ends marijuana and human smuggling, wouldn't hard drug smuggling continue? Legalizing and taxing a prohibited item reduces related black market activity by 95% historically. Thus, border apprehensions per our model would fall from about 2,000 / day at present to 150 / day in a market-based system. This small band of residual border jumpers would face off against 26,000 Border Patrol agents, a laugh-out-loud ratio of 100 agents to every illegal crosser (on a daily basis at least). Smuggling hard drugs is not easy with those kind of odds. Nor have hard drugs historically come across the open border. If apprehension rates of border jumpers are 55-70%, as we have discussed earlier, then smugglers would presumably lose that percentage of their contraband. By contrast, we estimate the interdiction rate of hard drugs at official crossing points in the range of 4%. That's why 85% of hard drugs come through official crossing points, not over the unsecured border. With a 95% reduction in illegal border crossings, virtually all of the hard drug smuggling trade will be driven to official crossing points.